Take the software features of the Visor Edge, the form factor of the Visor Deluxe, add more memory, and you have the Visor Pro. The Visor Pro is a combination of all monochrome Visors to date, with a 33 MHz Dragonball VZ processor, 4-bit (16 shades of gray) monochrome screen, and Palm OS 3.5.2H3. I wish I still had the Visor Platinum, because the Visor Pro looks just like it, but seems to have a sturdier casing. At first I thought the casing was the same aluminum casing that the Visor Edge has, but it is plastic. 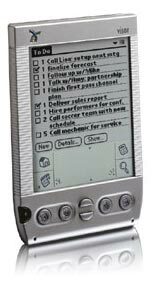 The Visor Pro is the first PalmOS device to offer 16 MB of memory. That translates into more applications and dynamic data that can be stored in the Pro's memory. Power users now have twice as much space to play with before utilizing Springboard modules for additional storage. The Visor Pro will be especially valuable for GPS users, as now more maps can be stored on the Visor. Handspring now needs a 16 MB backup module, as the Backup module was one of the best features of owning a Visor. Until then, modules such as the MemPlug can be used to perform a full backup on the Visor Pro.